Toyota Concepts | What Car? There are three concept cars on Toyota's stand at the Tokyo, showcasing where the company could be heading. 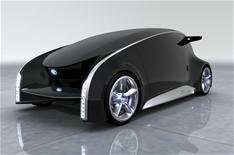 The first of the concept cars is called the FT-EV III (Future Toyota Electric Vehicle III). It's based on the Toyota iQ and is an electric car that's expected to go on sale in Japan and North America next year. Toyota has yet to decide whether an electric iQ will go on sale in the UK. The lithium-ion battery pack gives the car a range of 65 miles, which, says Toyota, would suit most city dwellers' needs. However the range isn't large enough for the car to qualify for the Government's plug-in grant, which puts up to 5000 towards the cost of a low-carbon car. This, combined with the high value of the Yen, could prevent the car being imported in to the UK, but electric iQs will be brought to the UK for evaluation next year. The second concept car is the FCV-R (Fuel-Cell Vehicle Reality & Revolution). The VW Passat-sized car is powered by hydrogen and has a range of around 430 miles. It is a four-seater and, says Toyota, has impressive luggage space. It's a precursor to a production-ready fuel-cell car that is planned to go on sale in 2015. The last of the trio, called the Fun-Vii (Fun-Vehicle interactive internet), looks even further ahead. While we can see only part of the car's profile in the picture released today, it looks to be a wacky concept car typical of the Tokyo motor show. The aim of the concept car is reveal Toyota's vision of the future where people, cars and society are linked.